ضیاء شاکری،, رامین, گودرزیان, شروین. (1392). مدیریت هدفمند نمای پنجم خیابان انقلاب اسلامی. مجله علمی-ترویجی منظر, 5(25), 16-19. رامین ضیاء شاکری،; شروین گودرزیان. "مدیریت هدفمند نمای پنجم خیابان انقلاب اسلامی". 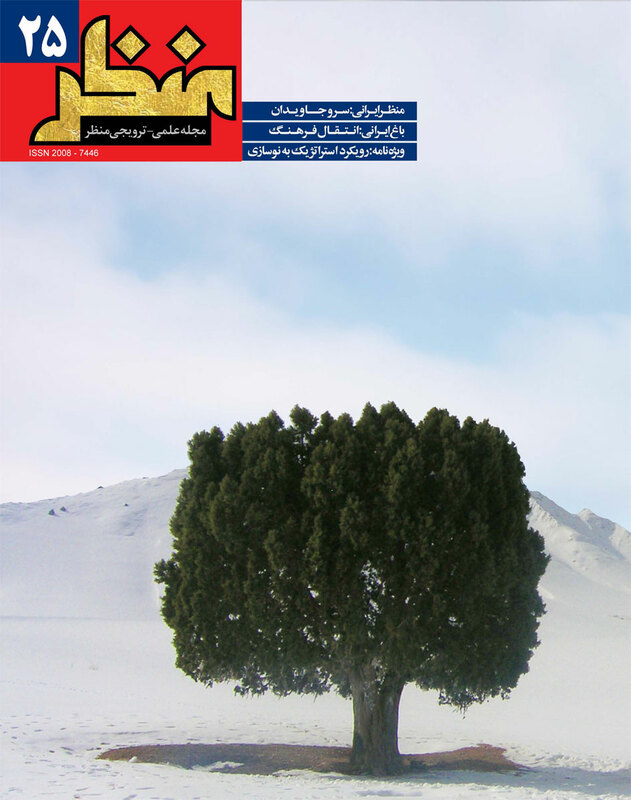 مجله علمی-ترویجی منظر, 5, 25, 1392, 16-19. ضیاء شاکری،, رامین, گودرزیان, شروین. (1392). 'مدیریت هدفمند نمای پنجم خیابان انقلاب اسلامی', مجله علمی-ترویجی منظر, 5(25), pp. 16-19. ضیاء شاکری،, رامین, گودرزیان, شروین. مدیریت هدفمند نمای پنجم خیابان انقلاب اسلامی. مجله علمی-ترویجی منظر, 1392; 5(25): 16-19. درک رابطه میان اجزا با کلیت یک پدیده از دیرباز مورد توجه آدمی بوده و هست. عطش درک واقعیت از طریق خروج از حدود یک پدیده برای فهم کامل آن، از ابتدا در وجود انسان‌ها وجود داشته است. ارضای این غریزه فطری چه در قالب امور متعالی و چه امور مادی، همواره لذتی بی‌پایان را برای انسان به ارمغان آورده است. از این‌رو آدمی همواره در پی رسیدن به جایگاه یا نظرگاهی بوده که چه به لحاظ عینی و چه ذهنی به اطراف خود اشراف پیدا کند. منظر هوایی نظرگاهی است که از دریچه آسمان، فرصتی برای درک کامل و جامع یک پدیده فراهم می‌آورد و وسیله‌ای برای فهم صفت‌های عالی و ابزاری قدرتمند در دستان رسانه برای جهت‌دهی به افکار عمومی است. برای رسیدن به درک کاملی از پدیده‌ها و رویدادهای عظیم اجتماعی نظیر انقلاب‌های مردمی، استفاده از منظر هوایی بهترین گزینه ممکن است. خیابان «انقلاب اسلامی» تهران به واسطه برخورداری از وزن ژئوپلیتیک1 بالای خود، قریب به سی‌و‌پنج سال است که به واسطه رسانه ملی خود را برای عموم مردم ایران و حتی جهان به نمایش می‌گذارد، تا آنجا که در جامعه جهانی کالبد این محور و حضور میلیونی مردم در این خیابان به عنوان نماینده‌ای از جامعه ایرانی قلمداد می‌شود. در صورتی‌که نمای پنجم3 رهاشده و بام‌های متروکه این محور کیفیت منظر هوایی آن را به شدت پایین آورده و ضروری است با مدیریت صحیح شاخص‌های کمی و بهره‌گیری از پیشینة قوی و کیفیت‌های بالای مناظر هوایی در شهرهای سنتی ایران، خیابان انقلابی شایسته‌تر را به جامعه جهانی معرفی کرد. The perception of relationships between components and the totality of a phenomenon has been considered by human beings for a long time; the thirst to perceive the reality of a phenomenon from outside in order to gain full understanding of it has been deposited in human existence from the very beginning. Satisfying this natural instinct in both spiritual and physical affairs has always brought infinite joy to mankind. In this sense, man has always sought to achieve a position or viewpoint to dominate his surrounding issues objectively and subjectively. Aerial landscape is in fact this viewpoint; a view through the gates of the sky and an opportunity for a complete and comprehensive understanding of a phenomenon. This view serves as a means to understanding supreme properties and is a powerful tool in the hands of the media for directing public opinions. Using aerial landscape could be the best option to achieve a comprehensive understanding of social phenomena and great events such as popular revolutions. Due to high geopolitical weight and thanks to the national media, Enqelab-e Eslami Street in Tehran has been on display with the aid of aerial views on different occasions for all Iranians and even the world for nearly thirty-five years. So far in the international community, this axis and the presence of millions of people in this street are considered to be a representation of the Iranian nation. However, the abandoned fifth facade, deserted roofs of the axis, etc. has drastically lowered the quality of aerial landscape of the street and thereby it is necessary to introduce a more deserving Enqelab Street to the international community by incorporating proper management of these quantitative indicators and by utilizing the strong history and high quality aerial landscapes of traditional Iranian cities. Displaying the presence of millions of people and communicating the correct understanding of the fifth facade of Enqelab-e Eslami axis in Tehran on different occasions - which serves as the main formative component of the aerial landscape of this street - has such weight that it could overshadow other undesirable factors which lower the quality of this landscape. Therefore, by taking correct actions and creating suitable opportunities in order to understand this forgotten facade, an exceptional and remarkable aerial landscape can be obtained of this axis. In fact, what has shaped the aerial landscape of Enqelab-e Eslami Street in Tehran is the perception created by the way the media demonstrates its fifth facade; This landscape is furthermore identified by historical and current events that continue to take place on this axis. It is crucial to realize that aerial landscape has a weak correlation with simply displaying the street’s physical view. In fact, although the body of a street is the main symbol of its presence, what is ranked next in importance is exhibiting the aerial landscape of the street. This is because it is the aerial landscape of Enqelab-e Eslami Street that has kept memories alive for the people of Iran and has given an independent identity to the axis and furthermore underlies the public's presence on this street. In other words, what is necessary in order to establish an appropriate understanding of the aerial landscape of Enqelab-e Eslami Street is to create opportunities such as efficient perspectives and management of the fifth façade in order to improve the quality of this landscape.